Enjoy Your Own Private Oasis! Bokeelia home with its own little beach! Stay in this beautiful three bedroom home and see what Pine Island Luxury Living is all about! 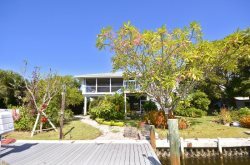 The Harbor front home has its own harbor frontage for your enjoyment. Set up a chair and enjoy the water and beautiful weather that Pine Island has to offer. There are very few homes that have what this property offers! You will be out fishing in no time at all as the dock, located at the rear of the property, is in the Back Bay. Power and water are available at the dock for easy charging and rinsing. There is plenty of room for you and your guests with three bedrooms and two bathrooms, a large living room and seating area overlooking the harbor. Wrap around decks make sure you are able to enjoy all of the beautiful views surrounding this home. Capt. Cons Restaurant is right up the road, be sure to try a piece of pie! Call us today to book this amazing home! *Please be advised - BEE BOXES ARE KEPT ON THIS PROPERTY. THEY ARE HARMLESS UNLESS YOU ARE ALLERGIC.